We are making an appointment at the dentist´s fun for children. Stepping into the practice feels like an imaginary journey. Appointments are made at our corsair-desk. In the waitingroom a huge aquarium full of colorful fishes elates the young patients. Additionally to „normal“ dental treatments we offer dental restoration under general anesthesia for extremly anxious patients or infants. When tooth damage is considerable, general anesthesia or the use of laughing gas is always a sensible option for children, who dislike treatment,. For the very first appointment KidsDocs has a special process to earn children´s trust. At the appointment on the first day there is the diagnosis. We take the time to get to know your little one and to do an x-ray. Afterwards we will agree on what treatment your child needs, together. The second appointment is for the treatment itself. Dental expertise and a lot of empathy is what makes us unique. 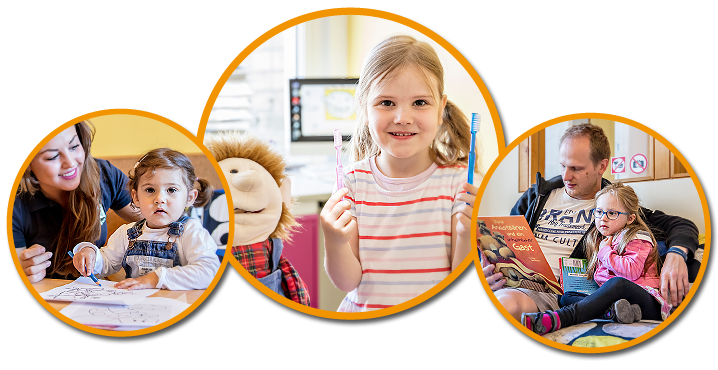 Our dentists are specialised in paediatric treatment, with the social and emotional expertise to meet the highest demands. Our pediatric anesthetists also possess excellent skills and know-how. Using highly professional surgical technology, they assure safety in anaesthetised treatments. They are at our side during the entire period of treatment and supervise the health of our little patients. Naturally, the recovery rooms are equipped with monitoring devices. If you are interested, we are happy to make an appointment. As English isn´t our mother tongue an to avoid any language difficulties you may write an email first - so that we are perfectly prepared for your visit.